No need to cut this page in half if you can't learn how to create a cute lumberjack clipart like this one! All you need is a pencil, a piece of paper and a little bit of patience! Indeed, I will show you how to illustrate the character found below using basic elements that are easy to duplicate. In most parts of the world, lumberjacks have been replaced by huge machines that can cut several trees in minutes. Of course, these trucks and machines are operated by men and women, but the job of lumberjack as we know it is slowly disappearing. Ready to draw a cool character wearing the traditional outfit of a lumberjack? Great! Let's proceed with the first step now! 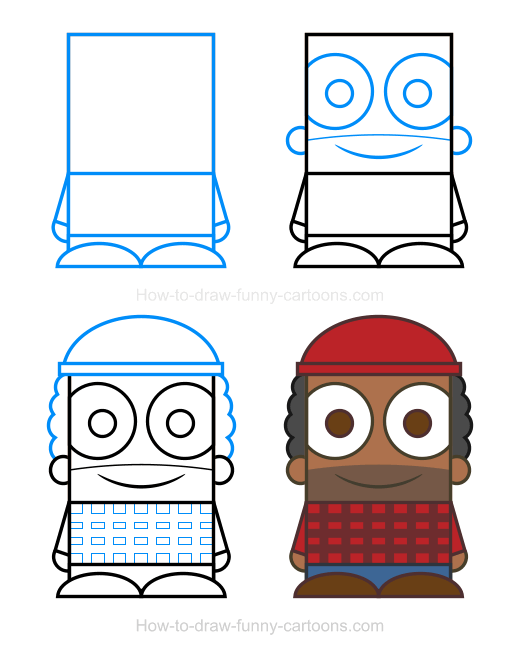 Let's begin with the basic elements of this cartoon lumberjack. 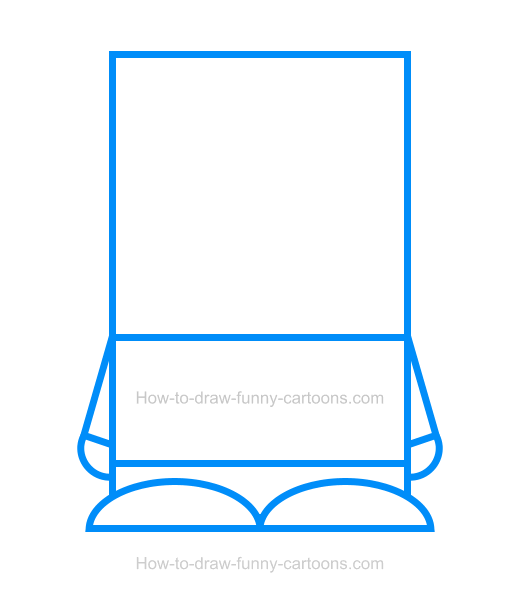 First, you can draw the head using a perfect square. Then, a rectangle can be added below to form the body. Another rectangle (slightly thinner than the previous one) is also drawn to illustrate the legs. The feet are made from a couple of curved lines. You can also use thin rectangles to create the arms and small circles to represent the hands. Once you are finished, you can proceed with the second step. In this step, you can add more details inside the head of the character. You can start by sketching large circular shapes to create the eyes. The pupils are done using smaller circles. The mouth and the beard are drawn from curved lines and the ears are made from small circles. Cool! 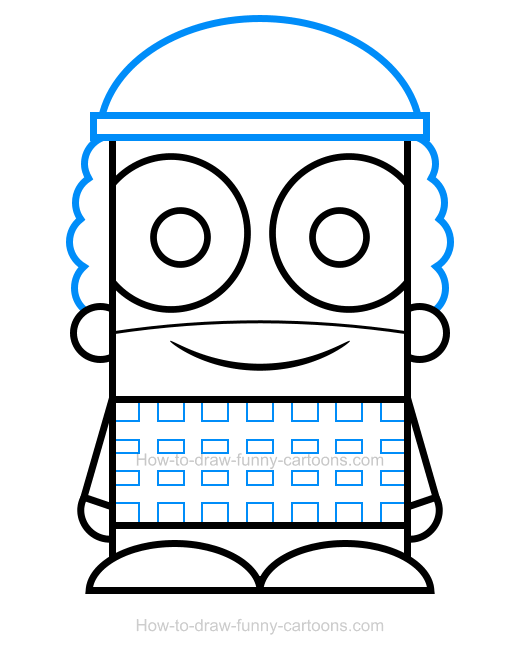 Let's turn this generic character into a genuine cartoon lumberjack. First, you can sketch the hat using a long and thin rectangle and draw a curved line on top. The hair is made from several small curved lines. Complete this third step by drawing a pattern on the shirt of the character. That's it for the drawing part! Let's add colors now! In this case, red is the most obvious color that must be used to fill in this illustration. The hat and the shirt are filled with this color. The hair is dark while the pants are blue. Notice how the shoes are also filled with a dark brown color. Great! 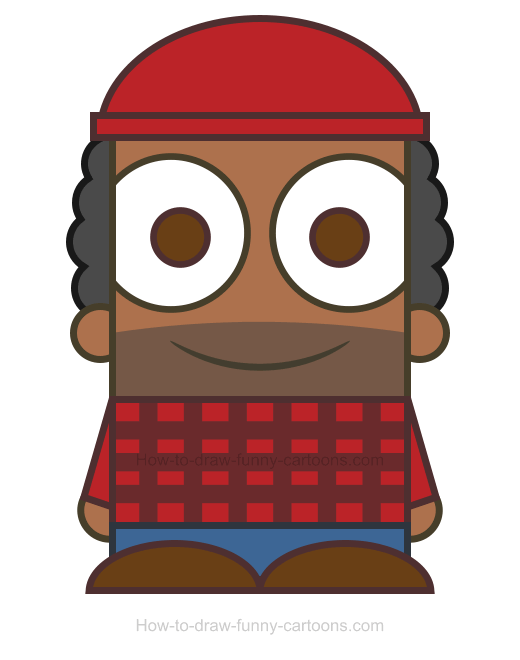 This lumberjack clipart looks terrific! Seriously!